Beautifully maintained home on almost 3 private acres with a garage/workshop that fits 6 cars! This home has 4 bedrooms and 3 baths. The home can be set up for two residences; a private vacation rental or in-laws set-up with its own entrance, tank-less water heater and private drive. This part of the home has one bedroom, large beautiful full bath, den and kitchenette with bar and there's even a private fenced patio! 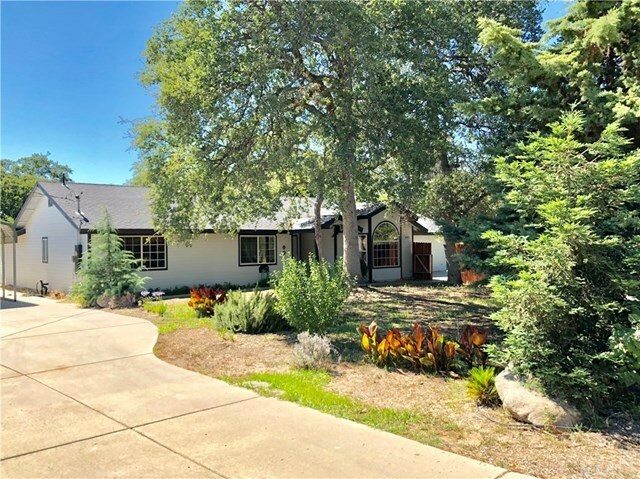 Out back, there is a cement patio, lush green grass area, outdoor entertaining area and a wood deck surrounded by beautiful roses and mature trees. Beyond the patio and grass lawn, there are pomegranates, berries and a small vineyard, bursting with grapes! The yard continues to the HUGE workshop with all the bells and whistles. There is also parking on the cement driveway, next to the house, under the permanent carport. To the right of the house, there is a chain link fenced dog run, a horseshoe game and a fenced area for horses, goats or other animals. There is a wonderful seasonal creek (check out the photo with the dog!) and so much more to appreciate, so make an appointment with your local Realtor today!